The ideal family holiday oasis or sanctuary for executive rejuvenation, Abode At The Beach Club offers ground floor, two bedroom apartment fronting the award winning lagoon pool with swim up bar. Guests may choose to book the entire self contained two bedroom apartment, which can be configured to sleep one, two, three or four guests with a king sized double bed and two singles. The two bedroom apartment is airy and light filled, with private courtyards and ensuite bathrooms for each bedroom. Floor to ceiling glam doors make for seamless indoor/outdoor living, and complete air conditioning and ceiling fans create the perfect climate. Your apartment's open plan living area offers a fully equipped European kitchen including marble bench tops, microwave, dishwasher and stainless steel fridge. The lounge is complete with all your entertaining essentials; Smart TV, DVD and stereo sound system, as well as inside games for quiet time plus a library filled with movies and books to entertain the whole family. You have a complete laundry with washing machine, dryer and washing powders at your convenience and the bathrooms are appointed with all the necessary provisions including pool and bathroom towels, eco-friendly soaps, shampoos and conditioners. Please note: Complimentary use of a luxury 7 seater vehicle may be made available for selected bookings. Guests may choose to book the entire self contained two bedroom apartment, which can be configured to sleep one, two, three or four guests with a king sized double bed and two singles. Alternatively, the Beach Club offers accommodation configured as either a one bedroom, fully self contained poolside apartment or a one bedroom courtyard spa suite without kitchen. 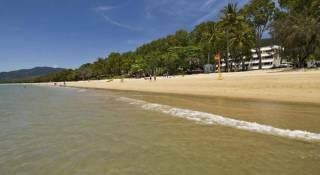 The quintessential Palm Cove tropical holiday destination, the Beach Club offers a location of pristine quality and wondrous natural and resort attractions. 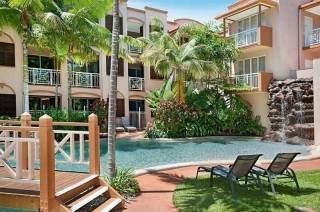 This 5 star beachfront resort located in the heart of Palm Cove boasts three swimming pools; a formal pool and spa, the award winning lagoon beach pool with swim up bar, and a secluded rainforest pool reserved for adults. Enjoy full sundecks with dappled shade from century old Melaleuca trees, or swim at the tranquil Coral Sea Beach and laze in your deck chair on the sand. The resort features three restaurants, each with its own style, boutique shops and a day spa. Stroll under the Melaleuca trees that graced the beach in Captain Cook's time and enjoy the lush tropical gardens, water features and sun decks throughout the resort. The resort also offers an undercover security car park, newly appointed fully-equipped gymnasium and tennis court. Indulge yourself at this idyllic beachfront resort destination by filling your days with activity or taking the time to relax and do nothing at all. A complete menu of activities is at your fingertips; enjoy water sports including snorkelling or taking a kayak around the nearby Coral Sea islands, go fishing, play golf or take in the delights of the tropical zoo. There are day tours of the Great Barrier Reef and the majestic World Heritage Daintree Rainforest, or you can enjoy a coastal drive to Port Douglas. 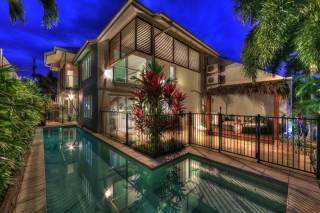 Palm Cove Village boasts world-class, award winning restaurants and spas at your door. Essentials are taken care of too, with galleries, cafés, resort wear, hair and beauty salons, car hire, medical, dental and pharmacy care close at hand. Please treat our apartments with respect as you enjoy a revitalising visit. At Abode at the Beach Club, we offer all the unexpected extras to make our home your home, and all we ask is that you enjoy their availability without excess. All items made available to you are made available for the duration of your stay at the apartments, and we ask that all items (including toys, DVDs, books, etc) remain in the apartment, in the good condition in which you found them so that our next guests may also enjoy all the extras that our home away from home offers. 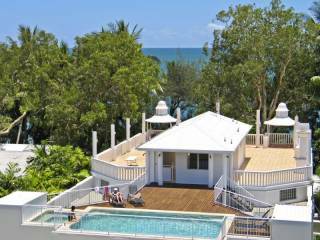 Abode at the Beach Club is a private family home away from home, with the host family spending many months of the year enjoying the tranquility of the warm and refreshing atmosphere of Palm Cove. Longer stay bookings are preferred, but all enquiries will be considered and guest contact returned. Choose your ideal stay: Guests may choose to book the entire self contained two bedroom apartment, which can be configured to sleep one, two, three or four guests with a king sized double bed and two singles. 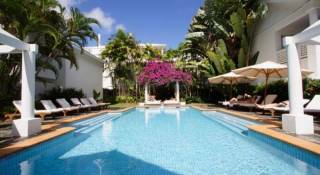 Alternatively, the Beach Club offers accommodation configured as either a one bedroom, fully self contained poolside apartment, or a one bedroom courtyard spa suite without kitchen. 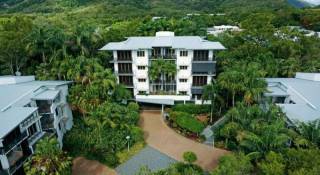 You will either make your own way to Abode at the Beach Club at 123 Williams Esplanade, Palm Cove, and be greeted by our local hosts who will guide you to your oasis. For selected bookings, our local hosts may have pre-arranged to meet you on arrival in the sunshine state and assist with your transfer to Abode at the Beach Club.